Hatbill Gang Titusville updated their profile photo. Iffin ya kin stand shootin in a Blizzard head on over to the Hatbill Gangs Saturday Jan 12th shoot startin about 9:00am. We'll be watchin fer ya!!!! Guns ready!!!! Iffin youse weren't there, ya missed a goodin...even Cypress Sam SHOOTIN Outlaw !! The 90s are gone the 80s are here...Fall is in the air!!! OK OK that's in Montana. The Hatbill Gang rides Again!!!! Sat Sept 8 (8:00 am...sign-up). Come 9:00am we"ll start warming up this cool morning...View MoreThe 90s are gone the 80s are here...Fall is in the air!!! OK OK that's in Montana. The Hatbill Gang rides Again!!!! Sat Sept 8 (8:00 am...sign-up). Come 9:00am we"ll start warming up this cool morning with HOT Lead. Be there ta give us a hand.Titusville rifle and pistol club Mims Fla.
Well the weathers fine, the range is set and all targets are dingable!! So saddle up and come shoot Sat. Aug. 11 8:00am sign-up...9:00am shots fired. The Hatbill Gang rides Again!!! Titusville rifle a...View MoreWell the weathers fine, the range is set and all targets are dingable!! So saddle up and come shoot Sat. Aug. 11 8:00am sign-up...9:00am shots fired. The Hatbill Gang rides Again!!! 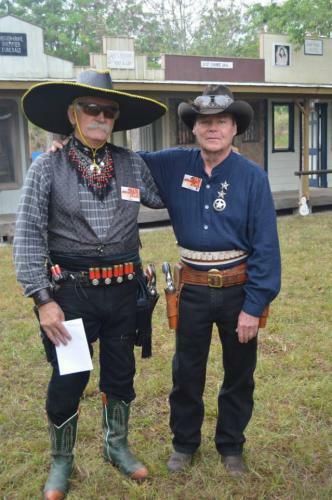 Titusville rifle and pistol club Mims Fla.
Hatbill Gang Titusville updated their cover photo. Sounds like a fun match!